As you all know from the news, we are living in very scary times. Things haven’t been this bad in a very long time, and perhaps 2012 is a self-fulfilling prophecy. •	People are rioting in the streets in nations all over the world, calling for their governments to step down. Some of these governments are responding peacefully and others are gunning the protesters down in the streets as if they are nothing more than pestilent rats. •	Our sworn enemy, even as identified in the Bible, not only has barbarically slaughtered over 3000 innocent Americans on 9/11 but they have officially arrived at our shores to stay. Despite an ideology that despises our rules and culture and ultimately cannot exist peacefully in a Christian-based nation, Islamic communities have taken hold all over this country, are challenging our laws, and using our very tolerance and multiculturalism against us. And now our finest lawyers are taking up their cause. Our President has announced worldwide that the United States is the largest Muslim nation. We are at the verge of building a magnificent mosque at Ground Zero as a symbol of Islam’s conquest of the US. —- Do these issues sound familiar ?? People who are legitimately concerned about the path this country is heading down and people who are genuinely affected by such issues are on a Homeland Security watch list as potential sources of domestic violence. I suppose that leftwing groups do nothing to warrant such government scrutiny. This is our very government engaging in “View point” discrimination. This is our very own government attempting to shut the conservative message down by issuing a report claiming that we pose a serious enough threat to internal security to be monitored. How long before Tea Party groups will no longer be able to even associate with one another? How long before the government tries to make that a crime? How long before the government issues subpoenas to seize our records and access our emails ? •	The federal government refuses to do its job to keep Americans safe and secure, which not only means safe from the violence that illegal immigrants bring but also safe from the insecurity that comes from a national debt so gargantuan that our very existence becomes precarious. We have a government that completely disregards the pleas of the American people to close our borders and to give assimilation a fighting chance. But no, the borders are open and violent criminals are pouring in. How many reports must we hear about rapes and violent murders and repeat offenses at the hands of illegals? How many are being swept under the carpet so we don’t have to hear about them and complain? We have no meaningful system to track murderous criminals and in fact, the government simply releases them back onto the streets after briefly detaining them and asking them to “please return for a deportation hearing.” I guess it is only the government who believes criminals have personal integrity because it would rather hire more IRS agents to persecute those not paying healthcare insurance than ICE agents to deport criminal illegal aliens in order to make sure our streets and neighborhoods are safe. •	Aol.com bought out Huffington Post to bring liberal media more into the mainstream where feeble minds can latch on to its message of a government nanny state. •	Democrats in government still don’t understand the gravity of our debt problem. We are losing stature in the world’s eyes. We are mortgaging our children’s future. We are putting the integrity of our entire system on the line. •	Americans still don’t understand what it means to be blessed with Liberty and the responsibilities that come from that. They still don’t understand that with liberty comes a great cost and that cost is eternal vigilance. •	Americans still don’t understand that the US Constitution is everyone’s personal charter of freedom. In defending the Constitution and its design for a limited federal government, we ensure our own liberties. If we fail to stand up for violations of this document, we chip away steadily at our very freedoms. Apparently not everyone values robust freedom. Apparently not everyone knows what to do with it. But unbridled freedom is the very core of what America stands for and it’s the very reason millions left their homeland in the 1700’s, 1800’s, and 1900’s to come to her shores. •	Our President has announced that we are no longer a Christian nation and with every official action and with every official word and government action on his behalf, he announces that this is indeed true. •	Our President just announced that he will REFUSE to enforce a national law which defines marriage as between one man and one woman. (I didn’t know he had that option to refuse to do his job). He declared that the law is unconstitutional. (Not the Supreme Court, mind you, but Obama himself made this enlightened decision). We are not a government of men; we are a government of laws. It would serve Obama, apparently a lawyer, to go back and read the Constitution (or read it for the first time, whatever the case may be). •	These are just to name a few of the current problems…..
WE ARE QUICKLY LOSING OUR VERY HERITAGE AND MEANINGFUL INSTITUTIONS. Isn’t that why we have joined the Tea Party? To recognize that our government has indeed become destructive of the ends for which it was created. And to alter it ….. peacefully. I know this year is an off-year election, but that should not give us reason to rest. The coming years will make or break us as a nation. A house divided cannot stand. A nation that doesn’t stand for good cannot ask for blessings. The Bible says we need those blessings or we will perish. But please know this. In Raleigh, state representatives feel the Tea Party presence and respect its power. This is undeniable. In Washington DC, representatives feel the Tea Party presence and respect its power. I’ve been there and I found this out for myself. The Tea Party movement is historic. It is real and it is very palpable. It stands in a long line of bold attempts by free men to stand up for their inalienable rights in the face of tyranny and oppression. 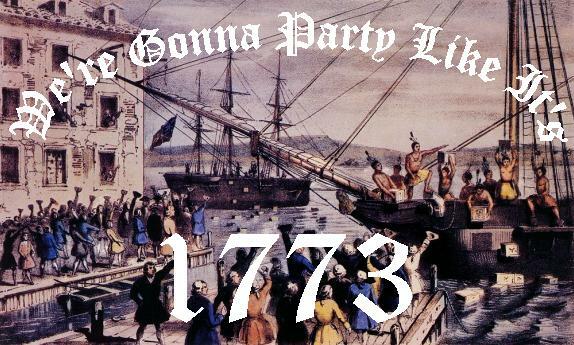 More and more, the Tea Party can be compared to the Boston Tea Party of 1773. It is a revolt against an oppressive government who believes that people are ruled by powerful men rather than rules. At the height of the Stamp Act crisis, which culminated in the Boston Tea Party, William Pitt proclaimed in Parliament, “The Americans are the sons not the bastards of England.” Today, just as back in the 1700’s, we the people are indeed ignored by our government, as if we too are bastards rather than sons and daughters. Our Declaration said this about King George: “A Prince, whose character is thus marked by every act which may define a Tyrant, is unfit to be the ruler of a free people.” Could this not easily be said of Barack Obama? The Declaration also cited this offense for justifying our separation from England: “…For abolishing our most valuable Laws and altering fundamentally the Forms of our Governments.” Is that not what Obama and his Czars are trying to do? It is said that since our feudal roots in England following the invasion by William the Conqueror (of Normandy, France), every time the people stood up and fought for their rights and freedoms, they were granted recognition and protection of those rights, and with each successful confrontation, they were granted greater rights. It would be an abomination if in our most civilized era, we were not wise enough to stand up for our rights or for the most ingeniously crafted Constitution the world has ever known. I am not sending this out necessarily to compel you to any action, but rather to remind you to please stand resolute in your commitment to effect meaningful change in this country – for our children and grandchildren. If you can find the time, please continue to be active in the Tea Party, please help recruit, please become involved locally, become visible, become vocal, become active, and continue to educate yourselves on the issues.